Marcedes Lewis has 13 receptions in the last four games. But his salary jumps to $6.7 million in 2014, leaving doubt as to if he will be in Jacksonville next season. 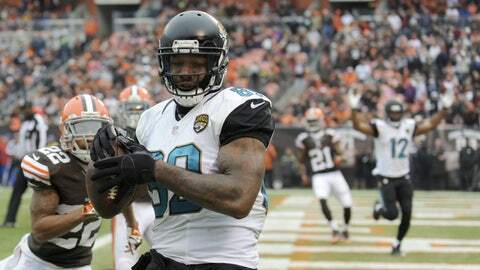 JACKSONVILLE, Fla. — Jacksonville Jaguars tight end Marcedes Lewis is making a strong case to stick around in 2014. Lewis has 13 receptions for 172 yards and four touchdowns over the last four weeks. Eleven of those catches resulted in first downs. He also tied a franchise record Sunday with a TD catch in his fourth consecutive game, emerging as the team’s top scoring threat. His recent success has a lot to do with his health — he missed six games with a torn calf muscle — and a little to do with the loss of receivers Cecil Shorts III (groin) and Justin Blackmon (suspension). Now that Lewis is fully healthy, the Jaguars are drawing up plays to get him more involved. Jacksonville plays at Indianapolis on Sunday. No one seems overly confident about Lewis’ future with the franchise, though. A first-round draft pick in 2006, Lewis signed a five-year, $34 million contract in 2011. The deal came after Lewis caught 58 passes for 700 yards and 10 touchdowns, and made the Pro Bowl in 2010. The coaching staff would like to have Lewis back, but his salary jumps from $4.2 million to $6.7 million next season, which would make him the team’s second-highest paid player. ”It’s inevitable not to think about the future,” Lewis said Monday. ”But at the same time, I’m focused on what I can do right not to secure my future. That’s what you have to do every year, because at the end of the day, nobody cares about what you did the year before. ”I can’t control the external factors. I just try to do the best I can, and if it’s good enough, I’ll live the results because I know my best is pretty good. Lewis has 294 catches for 3,513 yards and 25 touchdowns in eight seasons. Until this year, he played his entire career without any significant injuries, and he’s still known as one of the best in-line blocking tight ends in the league. His pass-catching abilities are drawing praise, too. Lewis has scored on a pair of jump balls, a screen play and a trick play in the last four games. He’s also had catches of 25, 30 and 45 yards, big gains that have led to touchdowns. The screen pass to retiring center Brad Meester against the Titans on Sunday was a play designed for Lewis that offensive coordinator Jedd Fisch tweaked to give Meester a chance to score in his home finale. I honestly think that this year’s different because Jedd is just creative,” said Lewis, who never felt comfortable with his role under the previous regime. ”He’s going to look for ways to get us the rock. I wasn’t in the offense at the beginning of the year, so I couldn’t really grow with it.